Just look at it, folks. That's how you generate preorders right there. Amazon is going to be swamped. I didn't believe it when Stan Lee said it back in March, and now that Activision's made it official I'm still not sure I believe it. And I call myself a true believer. 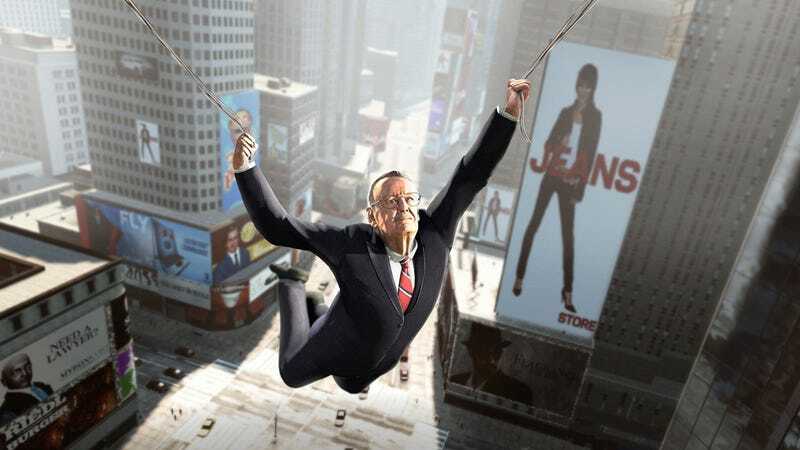 Stan Lee as a Playable Character in The Amazing Spider-Man, Can You True-Believe It? But yes, it is true. Players that preorder The Amazing Spider-Man from Amazon get a special series of missions featuring Stan "The Man" Lee. The legendary comic creator will take to the skies of Manhattan, borrowing Spider-Man's powers to keep his ancient sinews from snapping apart as he gracefully swings through the city, delivering witty banter in his signature style. Activision promises a special surprise at the end of the mission arc, perhaps something celebrating Spider-Man's 50th anniversary. Meanwhile, at GameStop, store clerks will sullenly sit in sad silence as no one shows up for their Rhino Challenge preorder bonus, which lets players go on a rampage as Spidey's thick-skinned foe. Nice picture, but it's no 89-year-old man in a business suit dangling from webs over the streets of New York, is it?